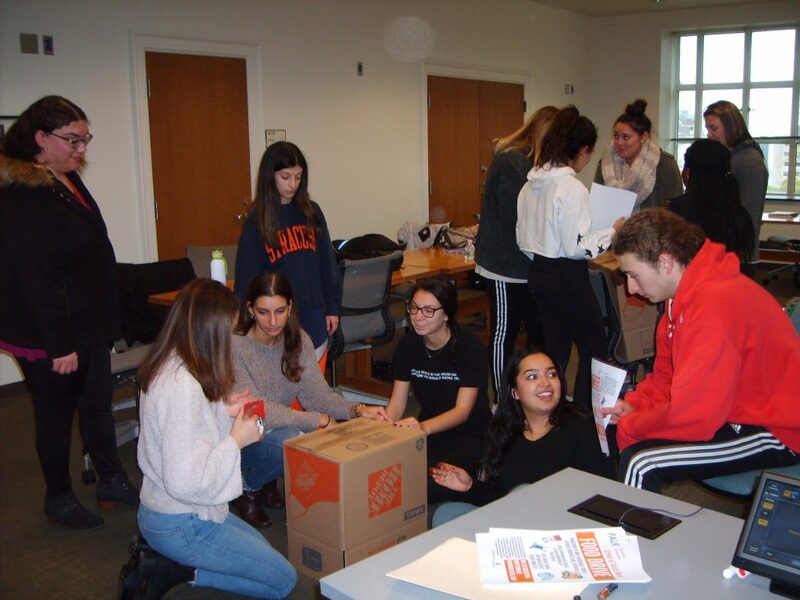 Social Work students assemble donation boxes for the 2018 food drive. Seniors in the Falk College School of Social Work are hosting a food drive through Tuesday, Nov. 13, to benefit Huntington Family Centers food pantry. Members of the University community are invited to contribute nonperishable food items and hygiene products. Donation boxes are available in each of the academic department suites located in the Falk Complex, as well as the student lounge located on the second floor across from the Falk Café on 2. The following nonperishable food items are needed: canned fruit, vegetables, tuna, and chicken; soup; spaghetti sauce; 100 percent fruit juice; rice; pasta; macaroni and cheese; jelly; and cereal. The following hygiene products are needed: toothpaste, toothbrushes, soap, shampoo, deodorant, toilet paper and feminine hygiene products. The food drive is organized in collaboration with Huntington Family Centers Inc. For more information, contact ljmarra@syr.edu or call 315.443.5562.